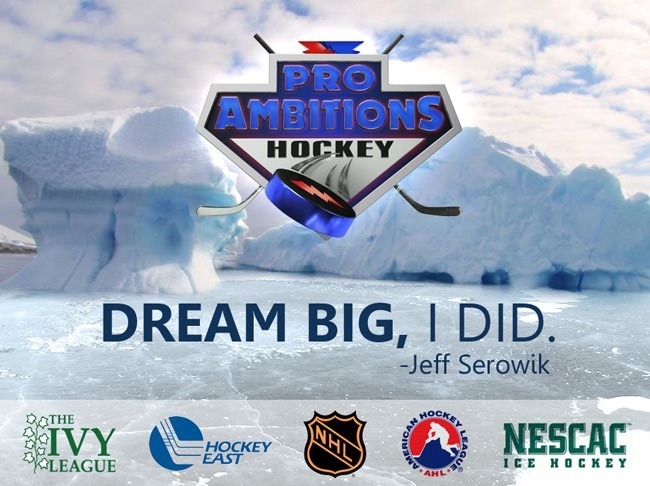 Dream Big - Pro Ambitions Hockey, Inc.
A self-fulfilling prophecy is a prediction that directly or indirectly causes itself to become true, by the very terms of the prophecy itself, due to positive feedback between belief and behavior. It took me many years to really believe in self fulfilling prophecies and myself. I am speaking as an athlete and a man. I think every hockey player out there knows the feeling of fear. Fear of making a mistake. Fear of not making a team. Fear of losing. Fear of letting down your teammates, coaches or parents. If there is one piece of advice I can give to youth players, it is to strengthen your mental game along with your skills. Every player is going to come up against opponents who are bigger, stronger, skate faster and have a harder shot. You need to cultivate your mind game. Even if you don’t have a physical advantage over an opponent, you can have a mental advantage. That can translate into superstar skills and instincts on the ice. Wayne Gretzky has always talked about the skill work he practiced on his athletic mind. He said, “ In a hockey game my eyes and my mind did the majority of the work for me, not my body. Over time I learned to get a feeling where my teammate was going to be. Where I needed to be, what I needed to do, what I wanted to achieve.” Accept yourself warts and all, no matter how humiliating or bad the situation may be. When you do a funny thing happens. Your skills, or opponents don’t seem like such a big deal. You will feel more empowered to solve these challenges. Fear is good. Face it head on and believe in yourself. Visualize what you want to happen. Don’t’ think about what you fear will happen. Hockey is a game of mistakes. Move on after a bad shift and visualize what you want to happen in your next shift. Take deep breaths while you are sitting on the bench. Get your head back in the game. The season I won the Eddie Shore Award, awarded to the Best Defenseman in the American Hockey Leauge, is the season I began consulting with a sports psychologist who really changed my game and my outlook on life. I was playing for the Providence Bruins, I was so close to my dream of not only playing in the NHL but playing for my hometown team and with the players I admire the most. Namely Captain Ray Bourque. I like to address him as the Captain because he epitomizes the word in every sense. An unselfish leader. Fred Neff and Max Offenberger are two sports psychologists who I strengthened my mental game with. They are still my friends and continue to mentally train NHL players, NHL prospects and youth athletes. They are formidable coaches at my Boston University boarding camp locations and help my campers on strengthening their own mental game. I will never forget what I learned from my first encounter with a sports psychologist that season. He asked me simply, what I wanted. What is my dream? I thought it was obvious. I wanted to play for the Boston Bruins. They made me say it aloud. I think it was the first time I said it aloud. I was taught to also say it to myself, in my head, over and over again during my games. I was taught to repeat it especially during a game after making a mistake or after a bad game where I could feel my confidence going into the tank. It was then that I started believing in myself and realizing I had to believe in myself to attain my dreams. That season in Providence, I broke the all time record of scoring by a defenseman. I was solid in my end. When there was an injury in Boston I was the call up to the Bruins. Dreams do come true. I will never forget playing with Captain Ray Bourque as my D partner in the Boston Garden. This is not to say everything went perfectly in my career after that season because it most certainly did not. I continued to have highs and lows and setbacks as everyone will and does. But from that point on I realized that my mental game is equally as important as my physical game. I had to believe in myself. Game on.